Flip through the record collection of any audiophile and you’re certain to find a copy of the soundtrack to The Harder They Come. The catchy title theme and the other core tracks by Jimmy Cliff, who stars as the movie’s protagonist. The remainder of the album being reggae roots hits from the late sixties and early seventies by seminal stars of the genre such as The Slickers, DJ Scotty, and Desmond Dekker. It also features versions of historic gospel melodies like The Melodians’ “By The Rivers of Babylon,” looming like a mournful leitmotif in the film’s more tragic sequences. In fact, the popularity of the soundtrack has somewhat eclipsed the film itself, perhaps a slight strike of poetic injustice against its genuine excellence. Sublime cinematography captures the exotic beauty of the Caribbean landscape, while the storyline documents the rich cultural life of Jamaica. Island dialect empowers the dialogue with poetic lyricism; bustling street scenes and festive dance halls provide a glimpse into the atmospheres where reggae was born. The plot centers around Ivan (Cliff), a poor mango picker who arrives in Kingston to fulfill his potential for musical stardom. But his talent is exploited by a wealthy record producer, leaving him desperate and embittered. Frequently the plot references an admiration for the Spaghetti Western and its glorification of outlaw justice vis-à-vis the struggle of the artist to succeed amidst economic oppression. Eventually inspired by a screening of Django, Ivan styles himself into a fetishized life of crime, accented with gold-rimmed aviators and gun-toting press photos. 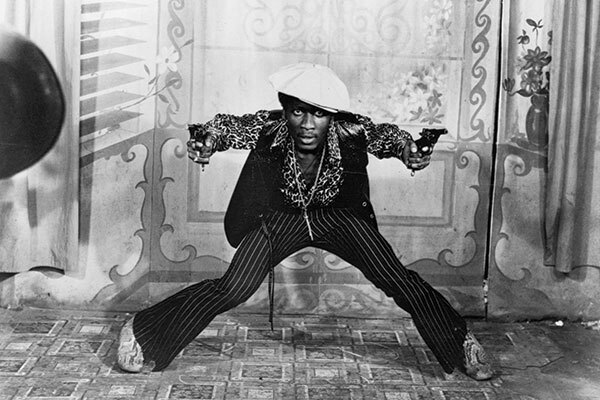 The Harder They Come was the first feature film by a Jamaican-born producer, Perry Henzell, also its director and co-author. When he died in 2006, the Los Angeles Times Obituary hailed the film as a landmark cult hit that introduced reggae music to an international audience. It was a hit on the island upon its initial release, and then marketed as blacksploitation film on the midnight circuit in America where it developed a devoted following with its potent use of music, and the unique rhythm and pace that are its compliment. The Harder They Come will screen this Friday night at 6:00pm.